Following a national competition organised last year in Singapore to develop green solutions for the shipping industry, prizes have been awarded for concepts that will contribute to the reduction of CAPEX when retrofitting vessels for LNG marine fuel propulsion. Professor Low Teck Seng, Chief Executive Officer of the National Research Foundation (NRF) presented the prizes at the Singapore Maritime Technology Conference (SMTC) 2019 last week. The proposals by the inning three teams outlined ways to reduce costs and streamline retrofitting operations such as using alternative materials to store LNG fuel, improved methods to install LNG fuel systems and alternative methods to speed up retrofitting process. The competition was jointly organised by NTU through its Maritime Energy and Sustainable Development (MESD) Centre of Excellence, Shell Eastern Trading (Pte) Ltd and quality assurance and risk management firm DNV GL Singapore Pte Ltd.
Maritime industry is facing increasing social and regulatory pressures to reduce the pollutants emission such as SOx, NOx and PM (Particulate Matter). LNG (Liquefied Natural Gas) powered vessel is one of the solutions. One of the key challenges in adoption of LNG is the high CAPEX. To overcome the challenges in economical LNG retrofit, revolutionary changes in design through bold new creative approaches are necessary. Participants were required to choose either a Tanker (Aframax), Containership (ULCS) or Bulk Carrier (Capesize) and work out solutions to enable low cost LNG retrofit. Dubbed the “Low Cost LNG Retrofit (LCLR) Challenge”, the competition asked participants to explore ideas that could help reduce the cost of retrofitting a Liquefied Natural Gas (LNG) fuel gas system to an existing ocean-going vessel with a conventional fuel oil system. 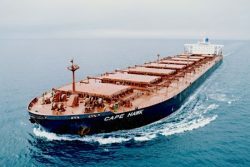 This would allow shipping companies to embrace cleaner fuels and reduce harmful emissions, including adhering to the International Maritime Organisation’s (IMO) stringent guidelines on ship emissions that comes into effect next year. Held from July to December last year, the competition attracted over 60 participants from NTU, the National University of Singapore, Singapore Institute of Technology (SIT), and Newcastle University Singapore. Two teams from SIT and one from SIT-Newcastle University were named as commendation award winners, with each group receiving S$5,000 each. The proposals by the three teams outlined ways to reduce costs and streamline retrofitting operations such as using alternative materials to store LNG fuel, improved methods to install LNG fuel systems and alternative methods to speed up retrofitting process. The proposals include using manganese-steel as a cheaper and viable alternative to the current nickel-based steels, factoring in the material’s tensile strength and feasibility to store LNG fuel at cryogenic temperatures (below 150 degrees Celsius). A panel of international experts from NTU, Shell, DNV GL, Keppel Offshore and Marine, WinGD, Wartsila, Sembcorp Marine, Singapore Maritime Institute (SMI), and the Maritime and Port Authority of Singapore (MPA) judged all project proposals.